I have an RS kit. Got it partly trimmed. Not looking forward to the ears as I usually screw up those and there aren't any clear lines indicating where they really should be trimmed to, like it's faintly possible to see on the face and back piece. One thing however. I drilled out the rivet holes on the face and the back and assembled the piece, putting the brow trim on... but something's horribly wrong and I'm afraid I may have screwed up badly. There's a huge cap between the brow trim and the face - nearly 4-5 mm. I just don't understand, as I drilled the holes right in the center of the round markings on the two pieces. I HATE ASSEMBLING VAC-FORMED HELMETS... GRRRRRRRR. Should I make new holes slightly further back, ignoring the original placement of the holes, or what? Is that even possible? With fiberglass it would have been an easy fix - heck, it would probably have been a one-piece for the whole face and back, eliminating the whole "my crappy assembly skills" issue. I knew I should have opted for an assembled one, so at least I would have prevented mauling one of these kits with my trimming and assembly skills. I don't know. All I know is I hate trimming and assembling vac-formed helmets. Post subject: Re: Assembly: What Did I Do Wrong? Interesting--I have one of the RS Props PP Helmets on the way myself. If you're using the original holes then it could be that the gap is there on the original helmet too I haven't looked (heaven knows there wasn't much precision in their assembly). If that's the case then you're not doing anything wrong. I don't know if you can rotate the face downward, with the screws as the axis, until the top of the face touches the inside of the brow. I heard that it may be due to the stretching/shrinking of the material after it's formed when cooling. Apparently a few don't use the original hole marks when assembling theirs, but doing the holes further back if needed. I did the modification on doing new holes slightly furhter back just now before coming back to read those suggestions on MEPD, thinking that it couldn't hurt at this point. Was just worried I had to do the new holes too far back, so the ears don't cover the further forward holes. It's not exactly tight, but it is okay if I do the higher brow version, then the gap is barely seen. Can't get it done flush now, as the new holes prevent that. Could maybe have gone back an extra mm on one side, but maybe it gets tighter when screwing on the ears? Hopefully it won't pull the gap wider. Damn... I hate vac-formed pieces. I have some leftover material that could be glued to the inside of the face on his left side, where I would likely do a new hole a tad bit further back still. That could give it some support, if I need to go further back to accommodate the ears pinching things. I like things to be tight and neat and not show any gaps, even if I make it more inaccurate by doing so. I avoided the original holes.I always assemble one side first as you can then push the face into the cap just in case there is a slight gap. The other thing to remember is that some original helmets have a gap between the face and cap. I have a Ginov2 assembled by him and it has a gap. Yep, on the both i have , also not the original holes were used. My painter who made me the second helmet said( the first one was made by Rob from RSprops), it would be extremly wonky with the original holes.He self build 4 RS helmets till now so i think he know what he is telling. But they are made out of ABS , as it seems you have one of there PP lids. Don't know how this material is to work with. If you don't have access to the site I will gladly copy and paste the content with the info. Related the gap between the dome and the face-mask I don't worry to much about it. I have seen it in some stunts helmets but for sure is very distinctive on the hero helmets. I remember Paul(TM) broght it over in a conversation I had with him when I was constructing my hero. Thanks guys. My helmet is ABS. It's really incredible. I thought the ABS helmet was sharp and showing a lot of detail... but man... those PP helmets are a sight to behold. It's insane the amount of detail those are showing. I've had the same problem with the te2 I am building over the past couple of days. I'd even clamped the brow section together but it shows how things can move about. Was pretty panicked about it but scoured the photos and there are quite a few a bit like that so I relaxed. I guess it's pretty hard to for together perfectly. The detail on my ABS lids are sharp as on the PP ones.There is nothing missing or soft. May you have a sot pull? I got one of the gloss ABS helmets. I'd love to see pictures of yours showing the same amount of detail as in the PP pictures shown on the RPF. ...and your using the original holes and you have a gap? I'm having the same problem Paul. Got my PP helmet this morning and drilled out the original rivet holes immediately. Sticking some bolts in them, I tried to line up the bottom parts (since there arent clear holes there) and I encountered the same thing that happened to Carsten. 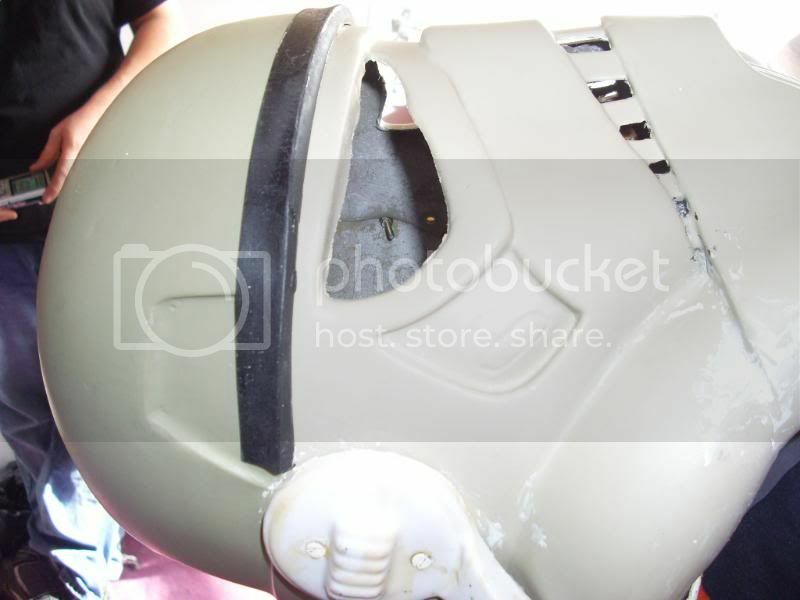 Anyone want to put it together for me so my awesome helmet doesnt look like swiss cheese by the end of it? Interesting--no gap on the original. My PP helmet arrived today as well. I'm still at work so I haven't cut into it yet--lol. Because of this issue I was going to do some research over at FISD et al and see what results people were having assembling their helmets. If I remember correctly I did the faceplate holes about half a cm further back on mine. It just seemed to line up better that way.Then tilted the face accordingly and added the bottom rivets. I don't really want to pull it apart to show as its all painted up and finished.